The incident took place at Dawn on Thursday when a group of about 25 Mapuche Indians and their supporters raided a farm and burned the livestock feed. Police who had been charged with protecting the farm after a number of similar incursions, gave chase and fired on the group who retreated to a nearby school. Catrileo was shot in the stomach and died at the scene. Catrileo's comrades took his body and refused to hand it over to police but after negotiations organized by Villarica Bishop Sixto Parzinger worked out a deal in which they were willing to turn over the body. The human rights group Amnesty International has demanded a full investigation into the incident. Activists rallied outside the La Moneda Presidential Palace in Santiago and died at least one of the Palace's fountains blood red to protest the murder. Riot police clashed with demonstrators and made a number of arrests. Dozens of Mapuche activists languish in prisons as a result of their resistance to the state in defence of their rights to land and acts of sabotage against corporations and businesses that pollute and poison the land. Mapuche prisoners have used hunger strikes to call attention to their struggle and incarceration. Anarchists support and have been participating in the Mapuche's fight for autonomy. 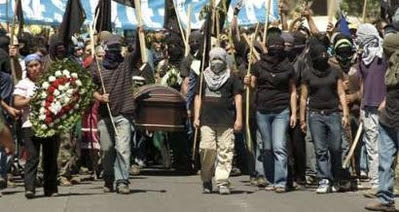 In 2004 another student and anarchist Gustavo Fuentes was shot by police while participating in a Mapuche solidarity action in Santiago. A funeral procession was held earlier today for Catrileo in the regional capitol of Temuco. Masked participants carried black flags and long sticks.